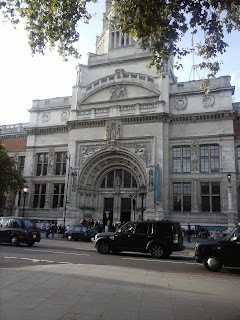 I went to The Victoria and Albert twice in the last week intending to see both 'What is Luxury' and the Curiosity Cloud. The first time was on Thursday evening after work, which gave me 45 minutes. Barely time to do the Luxury exhibition and have a good look at this object. Described (or titled) Zotem, it was considerably more impressive than the Luxury exhibition, which was just a collection of objects that didn't particularly interest me. Possibly I don't really 'get' luxury - especially when it consists of the highly expensive but terribly uncomfortable. To me luxury has to be rounded and fluffy and tooth-rottingly indulgent. Otherwise it's function is purely to impress others, and having to impress others is about the least luxurious thing I can think of. Anyway I didn't find the cloud, so on Sunday I went back again. But despite leaving home at 2.30pm - which should have given me lots of time - I again failed to see it. There's a long list of things I could blame - transport issues which meant it took me over 2 hours to get there, the fact the 'Norfolk House Music Room' is not marked on the V&As plans, and perhaps most significantly that it closed 30 minutes before the museum did (which means it was probably closed early on the Thursday too). Ultimately though I didn't see it because rather than ask at the front desk I preferred to wander the museum looking at all the other nice things and hoping I'd stumble across it. I was actually at the V&A just a few months ago for the Alexander McQueen exhibition Savage Beauty, which I mostly got to see because my aunt is a member of the V&A and we went up there at 3 in the morning. It was a good time, Savage Beauty was a real cabinet of curiosities and the oddness of being there at that sort of hour fitted well with the oddness of the show. Of course then much of the museum was closed off and quiet and I didn't realise how much bigger it seems now than it did 20 years ago. Perhaps I'm imagining it but they seem to have opened up more galleries. It is very definitely better kept. The fantastic restaurant rooms are restored and the jewellery section which I remember as dark and cloistered is all neatly laid out and brilliantly backlit. The garden was open and pleasant - I remember it as bleak and empty - with a cafe and raised platforms in the pond to give people extra space to sit and children the opportunity to paddle. I can't stress how much I like this proliferation of fountains that can be waded in or run through popping up in public spaces. Also wide walls that can double as benches. Public spaces should be friendly, they should be something you're encouraged to engage with and linger in instead of walk around or hurry through. If it was a stream you'd be in no doubt you're allowed to paddle. Why should a fountain be any different? I also found where the top of the rainbow-prism-slate Zotem came out, where the panelling in the ceiling had been lifted up, and even a whole theatre section I either didn't remember or which simply wasn't there before. But, as I say, I didn't find the room with the 'cloud' in it until too late. Still, as my aunt pointed out the day before when I had been in two minds whether to go or not; there will be something else. Barbara Hepworth on the 2nd for example, when the Tate has a late.